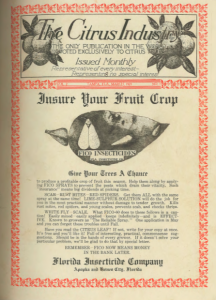 The March 1921 issue of Citrus Industry looks very different from today’s publication, but what remains the same is articles providing practical information for growers. I found the first issue (January 1920) of Citrus Industry, courtesy of Jen Dawson at the Citrus Research and Education Center in Lake Alfred, Florida. As I looked through the issue, I came across an article on soil tillage. Unfortunately, the pages had stuck together and only the last part was readable, but I wanted to share it and hear your thoughts on this article (primarily about plowing) that is almost 100 years old! “As soon as the banks protecting the buds are removed in the spring, start intensified cultivation to maintain a dust mulch for cultural irrigation and to keep the fibrous roots three or four inches deep in the damp soil, thus preventing their death through drying out in the surface soil during drouthy periods. At the beginning of the rainy season allow a cover crop to grow and, in early fall, on pineland soils, cut this cover crop, allow it to dry and then plow it under. Hoe the trees and thoroughly cultivate the middles. Cultivation in late fall should be reduced and entirely stopped during winter, so as to avoid undue stimulation during cold weather. “A careless plowman, or an inefficient plow may ruin a season’s results in a grove by cutting the feeding roots. If the plow fitted with a shoe to regulate the depth of plowing Is used to turn the soil to a depth of three to three and one-half inches, and the cultivation thereafter is carried on to maintain this root depth, no injury will be realized from dried out roots in the top soil. Brenda Eubanks Burnette is executive director of the Florida Citrus Hall of Fame. Pieces of the Past is presented in partnership with Florida Southern College’s McKay Archives Center in Lakeland.